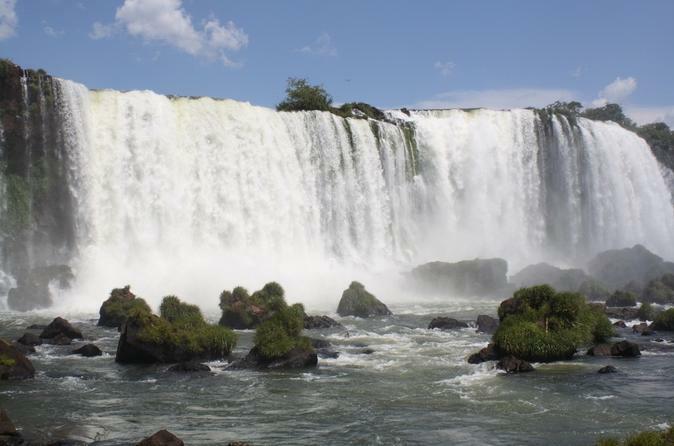 Make the most of your Iguassu Falls vacation and visit both the Argentinian and Brazilian side of the falls. Combine two sightseeing tours from Puerto Iguazu for a full day in both national parks – Iguaçu National Park and Iguazú National Park – where you’ll see incredible features like Devil’s Throat, the area’s largest waterfall. See the mighty Iguassu Falls from every angle of the Argentinian side on a full-day tour from Puerto Iguazú. Take a walk through the mist at the base of the falls, then follow the upper path for amazing panoramic views. And bring your wet-weather gear for an amazing boat ride under the falls, which was named one of the New Seven Wonders of Nature in 2011. Add on a jungle-truck ride through Iguazú National Park to enjoy even more amazing views, flora and fauna. Even if you're staying in Puerto Iguazú, you can still visit the Brazilian side of Iguassu Falls! Journey deep into Iguacu National Park, get an up-close view of two of its largest waterfalls and be prepared for unparalleled panoramic views. Combine two great sightseeing excursions on this cross-border day trip from Puerto Iguazu to the Brazilian side of Iguassu Falls and the Itaipu Dam. First, enjoy a guided sightseeing tour of Iguacu National Park and get up close and personal with the majestic Devil’ s Throat. 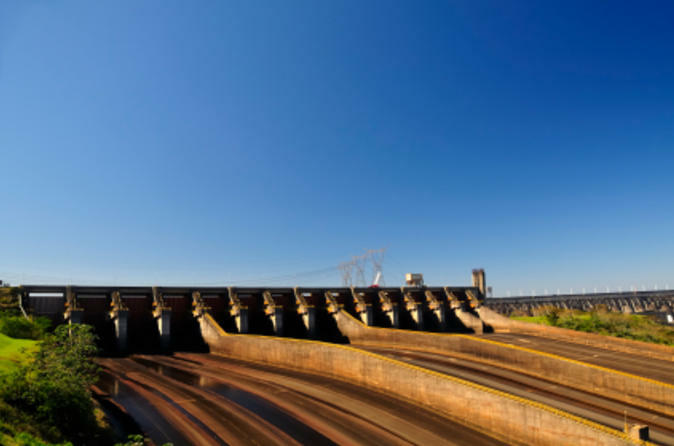 Then, head over to Itaipu Dam and explore the largest operational hydroelectric power plant in the world. Spend a day outside of Puerto Iguazú and discover the rich history of the Iguassu Falls region. 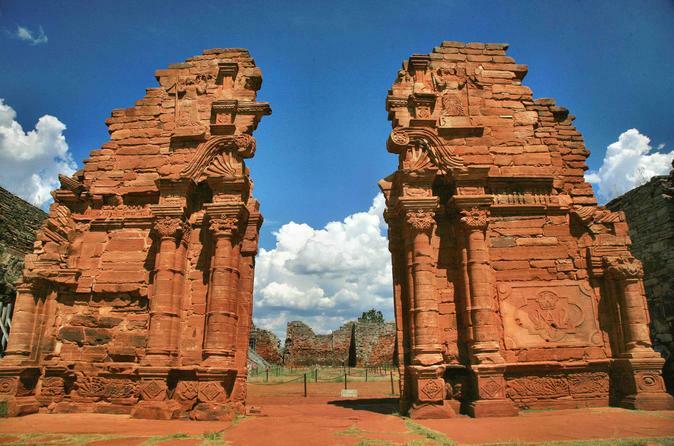 Learn about the famous Jesuit mission of 1632, which aimed to spread Christianity throughout Argentina during the Spanish colonial period. Then, explore the Wanda Mines and their sparkling crystals before heading back to your Puerto Iguazú hotel. 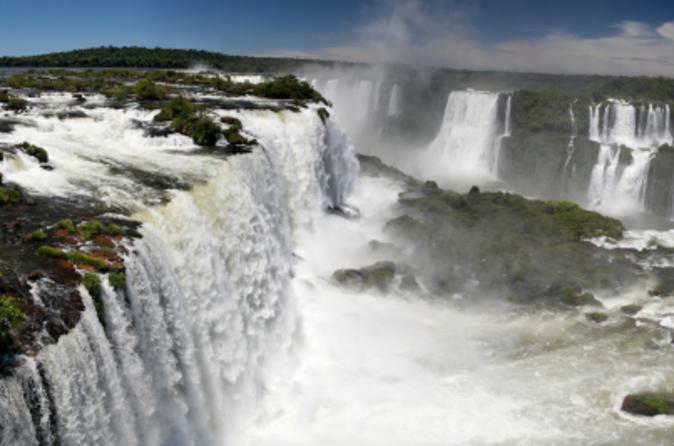 Experience Iguassu Falls on this 3-day tour with accommodation in Puerto Iguazu. 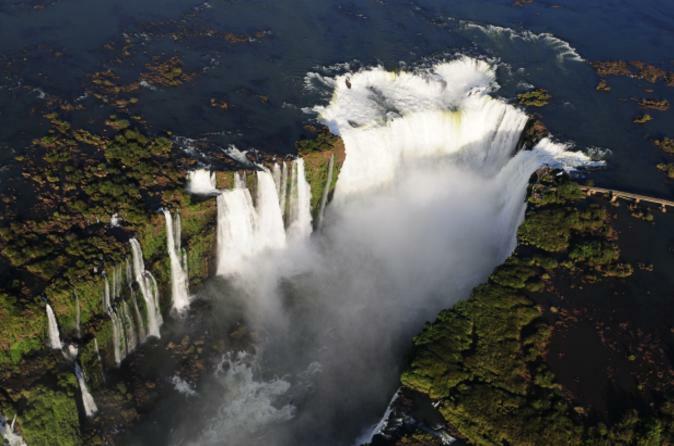 Admire this spectacular natural wonder on a full-day guided tour of both Iguazu National Park on the Argentina side and Iguacu National Park on the Brazil side. Between the two parks, you’ll see the best of the falls and have amazing photo opportunities. Learn about the nature and wildlife of the area surrounding the falls from your knowledgeable guide, and enjoy two nights of included accommodation, two breakfasts and transportation. 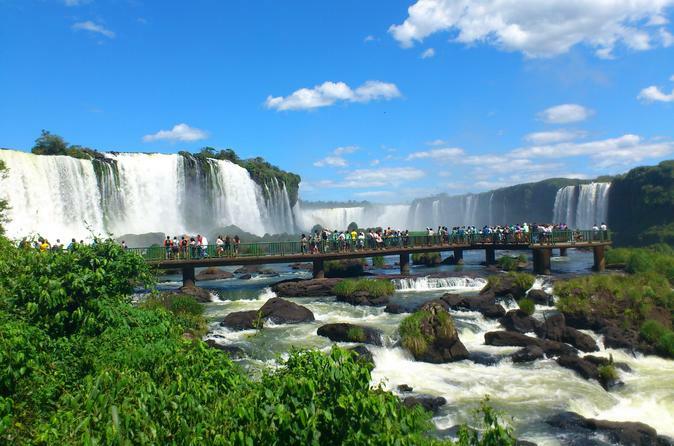 This 4-day, comprehensive tour to Iguassu Falls from Buenos Aires is full of adventure and natural beauty! Visit both the Argentinian and Brazilian sides of Iguassu Falls and spend two nights in Puerto Iguazu, Argentina’s gateway to the falls. With daily tours, a professional guide and accommodation included, all you need to bring is your sense of adventure! After you’ve spent your day exploring Iguassu Falls, spend the night experiencing a little South American culture! 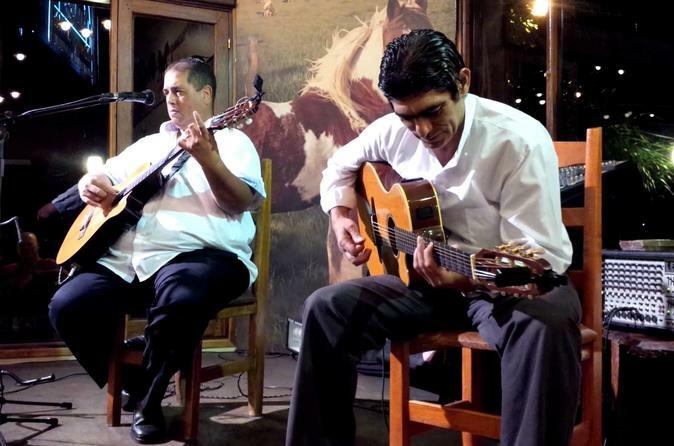 Cross the border from Argentina to Foz do Iguaçu, Brazil, for an evening of Latin American music and dancing accompanied by Brazilian cuisine. 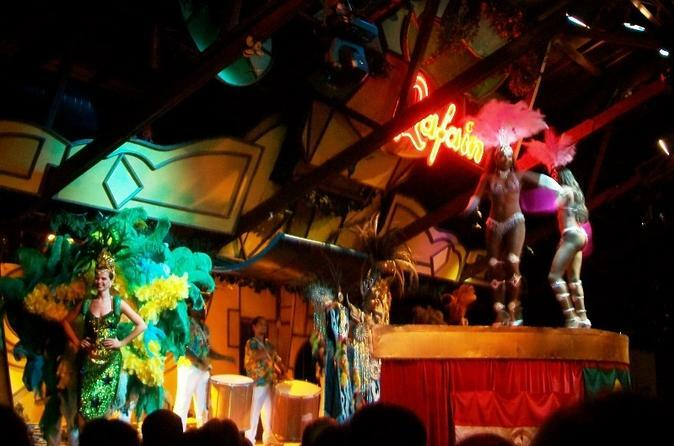 You’ll enjoy an all-you-can-eat buffet of Brazilian specialties before being entertained by a folkloric show that highlights the dances and songs of Central and South America, from the tango to the samba. It’s a sensational evening out from Puerto Iguazú! 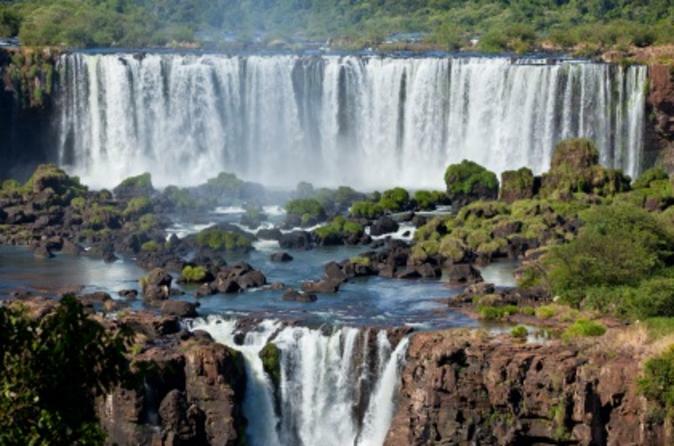 Fly from Buenos Aires to Puerto Iguazu for a 3-night Iguassu Falls adventure! Just 1.5 hours away by air, the town of Puerto Iguazu provides easy access to Iguazu National Park on the Argentina side of the falls and Iguacu National Park on the Brazil side, both UNESCO World Heritage sites. Visit both parks during two days of tours, marveling at more than 200 individual waterfalls, including the biggest and most famous: Devil’s Throat. You have your choice of 3-, 4- or 5-star accommodation; flights and breakfast are included. 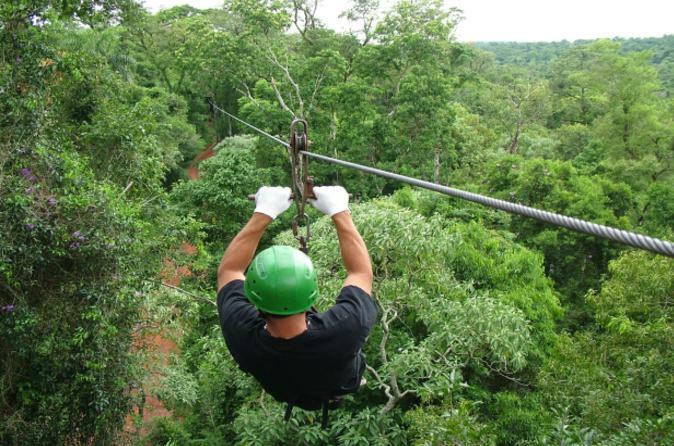 Experience the thrill of a 4-hour eco-adventure filled with trekking, ziplining and rappelling in the dense forest known as Selva Misionera just outside the city of Puerto Iguazu and near the famous Iguassu Falls. You’ll have time to admire the forest’s enormous variety of flora and abundant wildlife, including more than 400 species of birds. 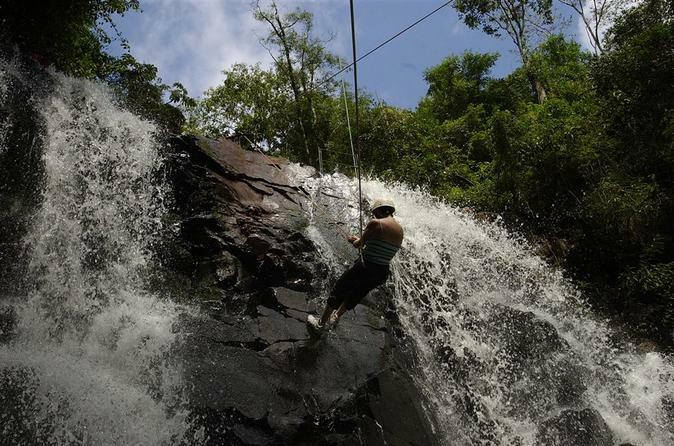 But this isn’t a bird-watching trip: you’ll not only go ziplining but will also rappel by a waterfall. From the Brazilian National Park, 3 kilometers of panoramic view of the falls with 270 waterfalls can be seen! During this tour we will walk about 1000 meters which takes about 1 hour with a low degree of difficulty. We'll start at the Das Cataratas Hotel and end at Canyon of the Devil's Throat. 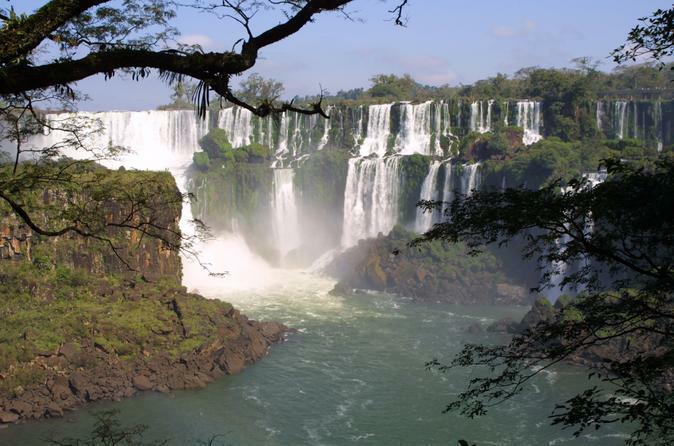 Explore the beautiful city of Buenos Aires and discover world-renowned Iguassu Falls over six incredible days. Take a sightseeing tour around Buenos Aires with your expert guide and visit the historical neighborhoods of San Telmo, Recoleta, La Boca and Palermo. See a traditional tango show and enjoy authentic Argentinean cuisine. 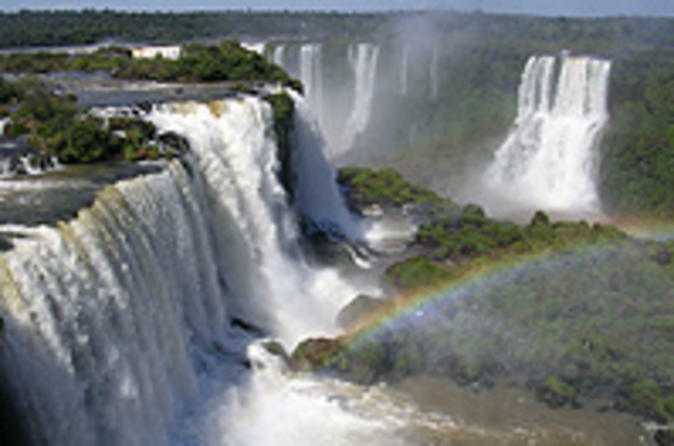 The highlight of your tour will surely be famous Iguassu National Park. Head south to Puerto Iguazu and admire stunning views of both the Brazilian and the Argentinean sides of the falls, including the largest fall -- Devil’s Throat. This 6-day experience is a perfect way to discover both the city life and the natural beauty of Argentina. Six nights of accommodation, some meals, a bilingual guide and transportation are included. Offering an incredible variety of flora and fauna, this natural sanctuary is home to magnificent Iguazù Falls, located in the Iguazù National Park, which geography, flora and fauna cancel the frontiers between Argentina and Brazil. The Falls attract and fascinate millions of tourists every year due to the impressiveness of its waterfalls and the overwhelming power of its watercourse. One of the most impressive natural sites of the world, recognized by the UNESCO as a Natural Heritage and one of 7 Natural Wonders of the World. In addition, transportation from/to the airport to/from your hotel is included! 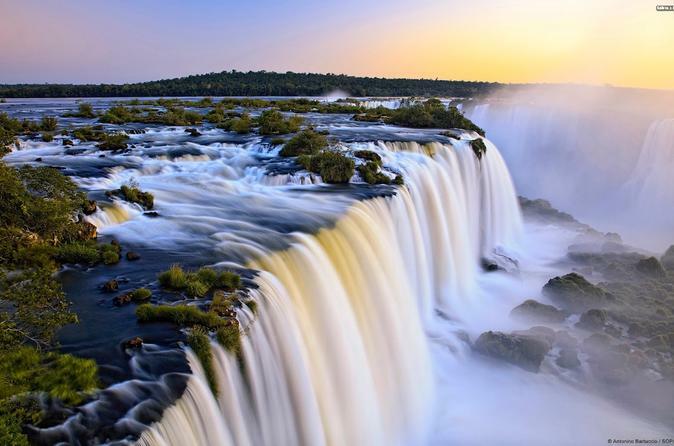 Come visit one of the Seven Natural Wonders of the World, the Iguazú Falls. 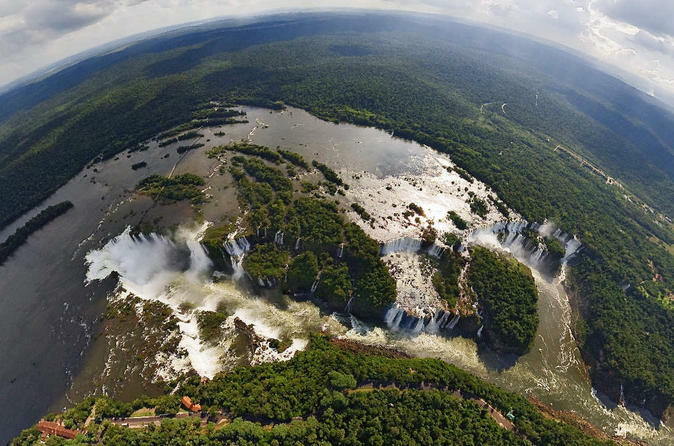 See natural beauty with this system of waterfalls that spread between Argentina and Brazil. During this 8-hour guided tour you will visit the park on the Argentinian side, walking its two main circuits of trails and platforms. The trips starts with the pick up from your hotel, in Puerto Iguazú or Foz de Iguazú. On arriving to the Visitors center, we get on the panoramic buses that begin the tour of the park, then we descend walking the paths. 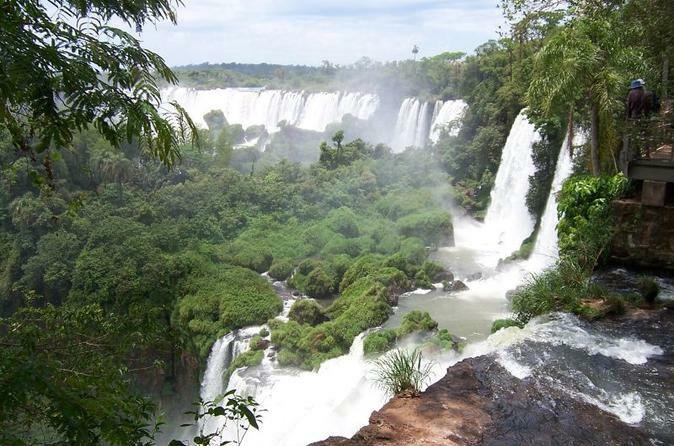 From the first balcony we'll have a panoramic view of the Argentinian Iguazú falls. Then after 950 meters with stunning views over the Iguazú river we get to the falls on the Brazilian side. 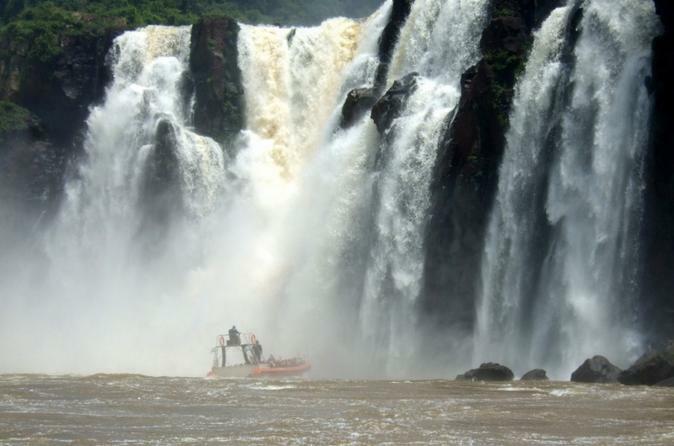 The Iguazu Falls tour on the Argentinian side takes longer ever since the inauguration of the new facilities for the upper, lower and the Devil throat circuits. Visitors will arrive to the New Visitors Center at the Iguazu Falls where they can walk to the "Natures Interpretation Center". 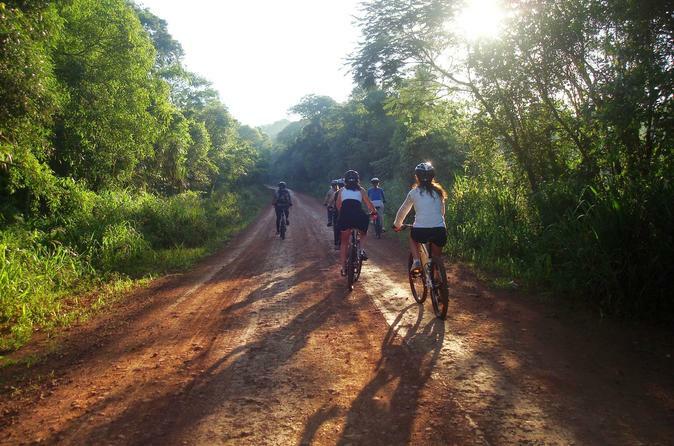 Enjoy a magnific bike trip from the inside of the Iguazú National Park to the Yaguareté Road. This in an exclusive adventure tour for bike nature lovers. Every day from 6:30pm to 11:30pm you are invited to share a special evening with dinner, and very special music. 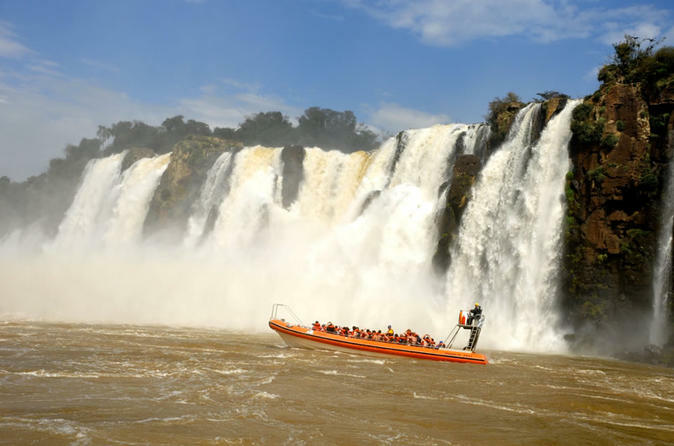 Join an 8-hour small-group tour to visit the Argentinean side of Iguazu Falls and enjoy soft adventure activities from Puerto Iguazu. Declared a UNESCO World Heritage site, Iguazu Falls consists of 275 waterfalls (mostly on the Argentinean side) with some up to 262-ft/80-m high. Your expert guide will lead you through the winding walking trails and walkways for approximately 5 mi/8 km through three different circuits: Upper Circuit, Lower Circuit and the trail to the Devil´s throat. Afterwards, head into the jungle where you'll be able to take advantage of included activities like waterfall rappelling, canopy zipline, and trekking. Tour includes hotel pickup and is limited to 15 people to ensure more personalized service. 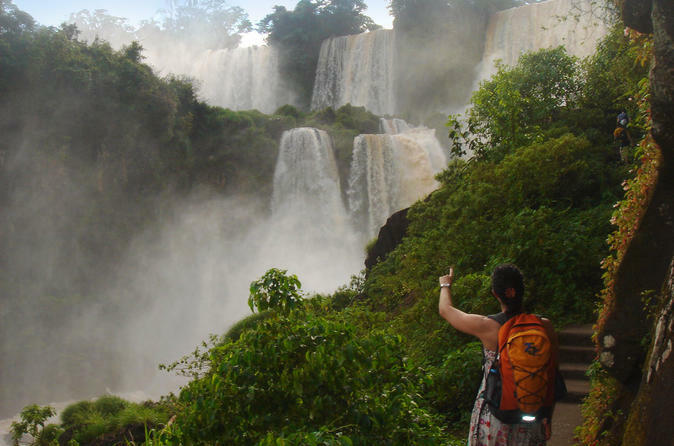 Walk along Iguazu’s impressive collection of waterfalls and feel the mist from the stunning Garganta Del Diablo. Surrounded by tropical jungle and home to incredible biodiversity, discover walking trails and Iguazu Falls´ eco-train that is in perfect harmony with nature. 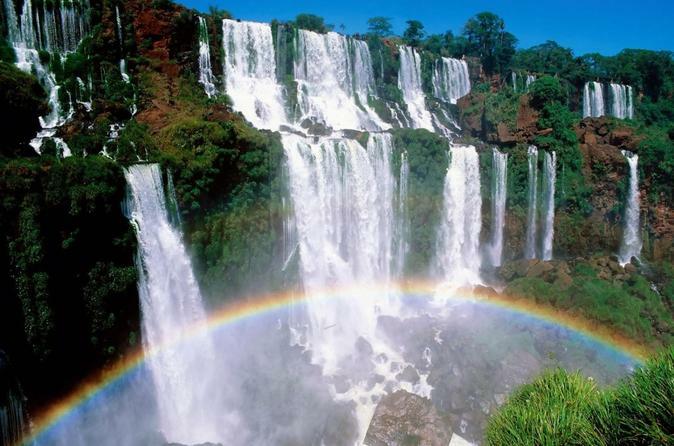 Iguazu Falls is truly one of the true natural wonders of the world. 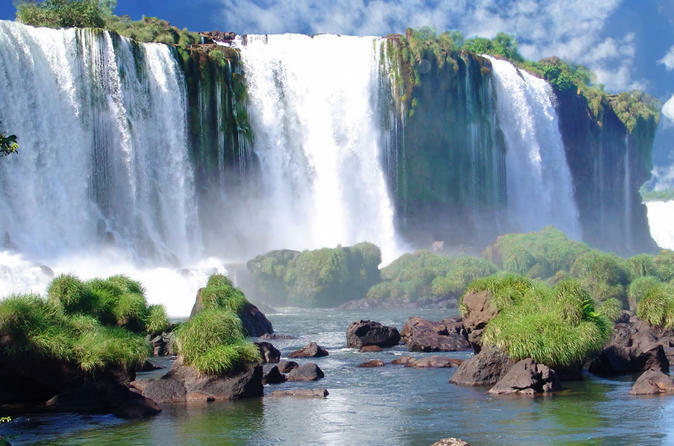 Spend a great day visiting the incredible Iguazu Falls, wonder of nature. We visit both sides of the river, walking through the Argentina and Brazil National Parks. At the Iguazu Falls, you will be able to see the best and widest panoramic view from the Brazilian side, and the balconies of Upper and Lower trails, the San Martin island and the gangway to Devil’s Throat on the Argentinian side. 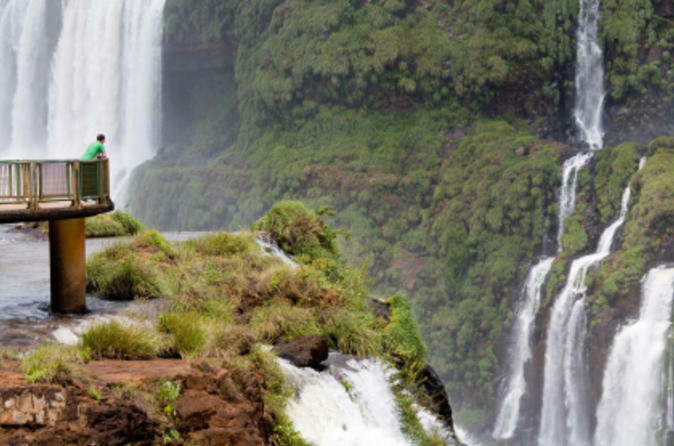 Embark on this adventurous 3-day tour of Iguazu Falls with a professional guide. See the Brazilian side, where you will walk several paths and take a glass elevator to attain aerial views. The next day, hike the Argentinian side where you will come across one of the most treacherous waterfalls, Devil's Throat. Enjoy daily breakfasts and round-trip transport to and from the airport. Fly over Iguassu Falls, one of the most dramatic and picture-perfect waterfalls in the world. Bring your camera and get ready to be awed by the jaw-droppingly stunning views as your helicopter floats above the falls, which are 270 feet (82 meters) high. 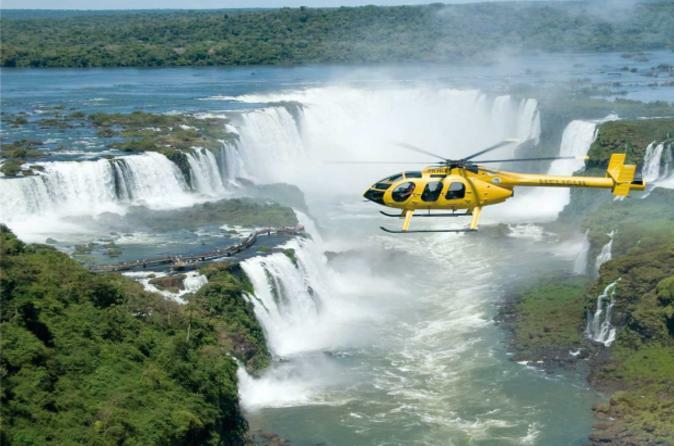 This 10-minute helicopter tour offers a lifetime of memories for its fantastic panoramas over the Iguassu Falls and the surrounding wilderness. Visit one of the world’s natural wonders that is declared a World Heritage Site by UNESCO. Iguazú Falls features 270 waterfalls over 3kilometers of tropical jungle that join the Argentinian and Brazilian borders. 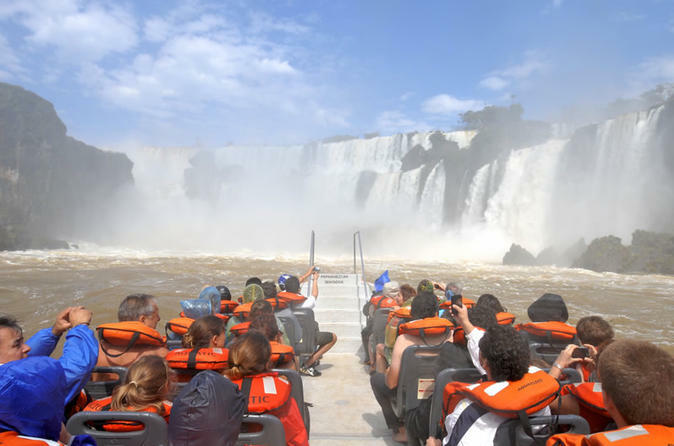 Tour Iguazu Falls in style. Surrounded by tropical jungle and home to incredible biodiversity, tour the falls on an Eco-train and discover why Iguazu Falls is one of the true natural wonders of the world. Without a doubt, Iguazu Fall from the Argentine and Brazilian sides, will be sure to impress. San Ignacio Miní stands as the best preserved Jesuit Mission of the 16th and 17th centuries throughout the Argentine territory. Around the main square, you find the Church, the “Casa de los Padres”, the cemetery, the houses and town hall. 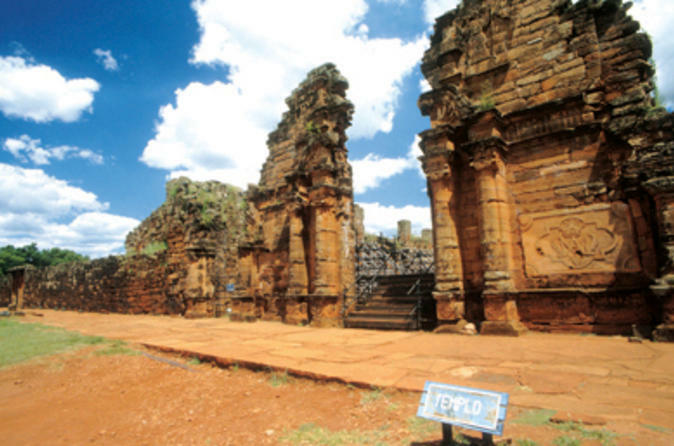 Native stones and large pieces of red sandstone were used to build San Ignacio city. The Wanda Mines is a great place especially known for its deposits of precious stones, turquoise, amethyst and rock crystal. Since 1976 they have become a tour for all those who come to these distances known as the Jungle region. Enjoy a magnific bike trip from the inside of the Iguazú National Park to the Yaguarindí Road. This in an exclusive adventure tour for bike and nature lovers.